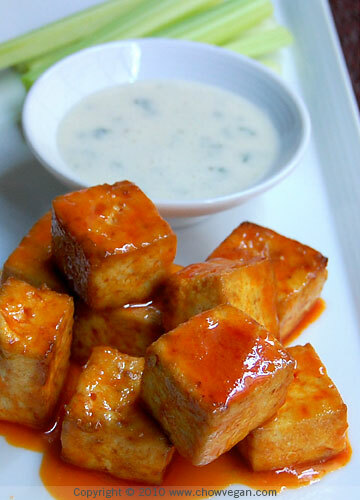 Ok, so I was skeptical but intrigued when I saw this recipe for Buffalo Style Roasted Tofu on pinterest. But I was craving chicken wings without the deep frying and I had tofu in the fridge so I thought I’d give it a try. Well am I ever glad I did! Way to go Chow Vegan! So simple and so delicious! I suggest only making as much as you plan on eating right there because these morsels are addictive! I did manage to save a couple for the next day and though still good they are definitely best when straight out of the pan. The only change I made was I used olive oil instead of vegan butter in the sauce only because I was out of butter. The butter would probably make the sauce a little stickier but the taste was still great. I haven’t tried the accompanying vegan ranch dressing yet, but I hope to later this week. Next chicken wing substitute to try this week is the Spicy Buffalo Cauliflower Bites by Skinnytaste. Check back later for my verdict on those (hopefully) tasty morsels! Wow looks amazing! I can’t wait to try this recipe!